The railroad's earnings and outlook could influence investor thinking on which stocks can outperform. Railroads always give great color on the economy, and if the latest earnings report from CSX Corporation (NASDAQ:CSX) is anything to go by, then overall conditions are definitely improving in the U.S. industrial economy. That said, it's not an even recovery, and some parts of the economy are improving more than others. Let's take a look at the details in the latest numbers and what they mean for investors. Overall, it was a pretty good earnings report from CSX, with the company managing to leverage 3% volume growth (our main focus) into 10% revenue growth thanks to a 7% increase in revenue per unit. In fact, excluding the impact of a $173 million restructuring charge, operating income rose 25.7% to $885 million. The pricing increase -- year-over-year all-in pricing increased 3.5% on a same-store-sales basis in the quarter -- is in line with what CSX and key peer Union Pacific Corporation (NYSE:UNP) reported in their fourth-quarter results in January. Union Pacific reported a 1% core pricing increase in the fourth quarter, compared to CSX's 2.8% increase. CSX's first-quarter number indicates strengthening conditions. Moreover, CSX's operating income margin ratio of 30.8% continues to reflect its productivity improvements as it seeks to play catch-up with Union Pacific's margin. 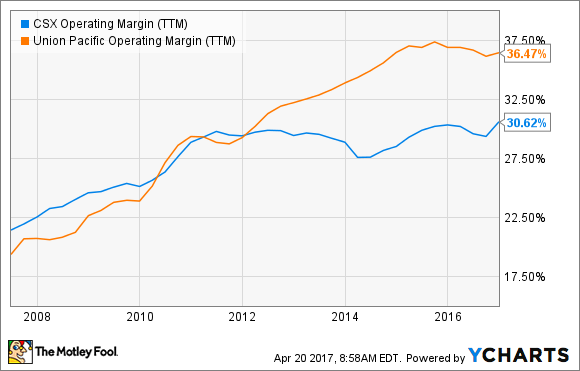 CSX Operating Margin (TTM) data by YCharts. CSX's results and commentary are obviously good news for the railroad industry, and so are most of its volume data. Data source: CSX Corporation. Volume measured by carload units. Year-over-year growth. The three industry winners from the earnings report were construction, automotive, and the related metalworking industry. For example, CSX claimed that the minerals volume increase was largely due to aggregate shipments relating to construction project activity. Similarly, management claimed that the metals and equipment volume increase was due to "improved steel production" and "increased construction related activity." These results and commentary mimic what the industrial supply companies like Fastenal Company (NASDAQ:FAST) and MSC Industrial Direct Co (NYSE:MSM) have been saying about the economy. For example, Fastenal's last two quarters have seen a notable pickup in its nonresidential construction and manufacturing daily sales growth. Meanwhile, MSC Industrial recently reported its first positive sales growth figure in its manufacturing end markets since the third quarter of 2015. This bodes well for a multi-industrial company like Illinois Tool Works (NYSE:ITW), which has heavy exposure to welding, construction, and automotive products -- particularly relevant because CSX referred to automotive volume increases "driven by SUV and truck shipments, as North American vehicle production increased versus prior year." Illinois Tool Works reports earnings on Monday, April 24. 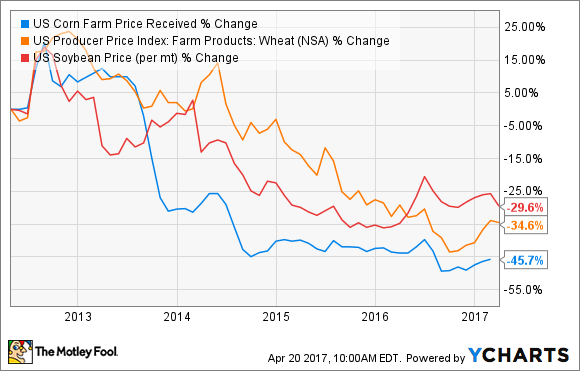 The agricultural market remains challenging -- not good news for investors in companies like Deere and CSX. There have been declines in the export grain market, while fertilizer sales saw reduced demand for nitrogen "reflecting the anticipated shift of acres from corn to soybeans." As you can see below, key crop prices remain at low levels relative to recent years. Moreover, forest products saw mixed performance. The positive came from good momentum in the housing market and building in general. However, CSX management's reference to "headwinds from electronic substitution" continuing to impact paper product shipments suggests there could be a structural problem with the paper industry. CSX's earnings report was a net positive for the industrial economy, and it was good to see ongoing strength in the automotive sector -- a question-mark area of the economy in 2017 -- while the return to growth in minerals and metals reflects an improving industrial and construction environment. Just don't expect agriculture to participate just yet.